I’m determined to write more, but to do so, you need a decent writing machine, ideally one that is (a) highly portable and (b) free from as many distractions as possible. Despite all the wonders of modern technology, it’s actually very hard to find a device that’s suitable. I’m not a fan of lugging a laptop around when I’m out and about, and in any case there’s issues with battery life and the infernal problem for anyone like me with a short attention span – connection to the Internet, and all the time-wasting that comes with it. Oh, look! An email! Or perhaps a slew of social media notifications! Plus the thing takes ages to boot up and get going with anyway. Same issues apply with tablets, and they have the added disadvantage of not having keyboards. I like a good physical keyboard. I’ve tried using my smartphone for writing with a Bluetooth keyboard, but that isn’t much fun either. What you want really is just a portable device that’s designed for just getting text into electronic form. When I was a student in the late nineties, I had a Psion 3a, and this miraculous pocket-sized device was brilliantly productive. 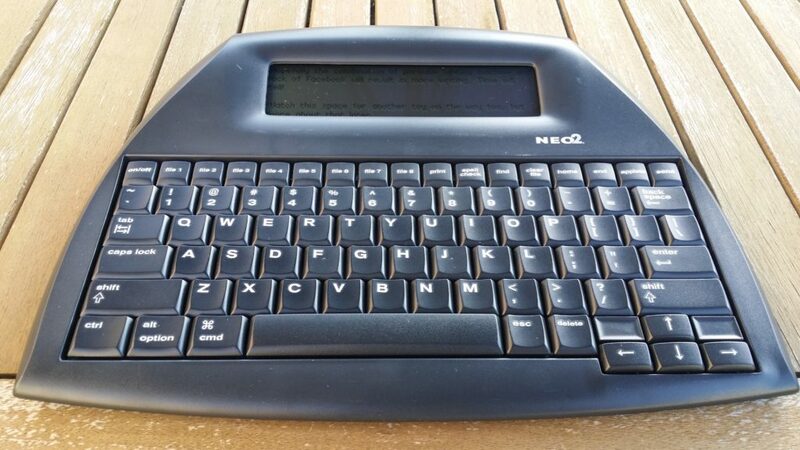 Instant on, small but usable keyboard, weeks of use out of a pair of AA batteries, and capable office programs that connected nicely with a PC. I wrote loads of my essays on my 3a and I loved it. I later had a few Series 5s, and they were even better, but sadly they’re not good for aspiring productive writers these days. Finding working ones is hard, and connecting them to modern PCs and converting file formats is quite challenging. I recently came across this article with instructions for converting an old laptop into a simple “typewriter”, that would just allow you to type and not a lot else. It worked, just about, but it was a struggle to get it properly syncing with Dropbox, was reliant on WiFi and on my old machine the battery lasted about half an hour. The novelty quickly wore off and it sat gathering dust. And here I am, typing this blog entry on it! For ease of use I really do think it’s amazing. Switch it on, type and off you go. No faffing about, no unnecessary bells and whistles, and nothing to distract you while you’re working. I have high hopes that this dinky little machine will actually make me write, and not get massively distracted by inconsequential rubbish. After I’d finished typing the basic text, I plugged it into my Surface Pro 3, fired up the web browser for updating my blog, and soon it recognised everything and “typed” my text into the computer. Not the slickest operation in the world, but it works! I just proof-read everything and made a couple of changes, and I’m using the Alphasmart as a plug-in keyboard to finish it off. Good that modern smartphones, PCs and tablets are, I’ve long felt they’re jack-of-all-trades-master-of-none devices, and there’s a lot to be said for using things that are the right tools for the job. This tool does exactly what it shoud – it gets your ideas out of your head and into electronic form quickly, for dumping into whatever program you need. I also find a small pocket GPS works better when I’m hiking, and my standalone cameras wipe the floor with my unattractive slab of a smartphone. 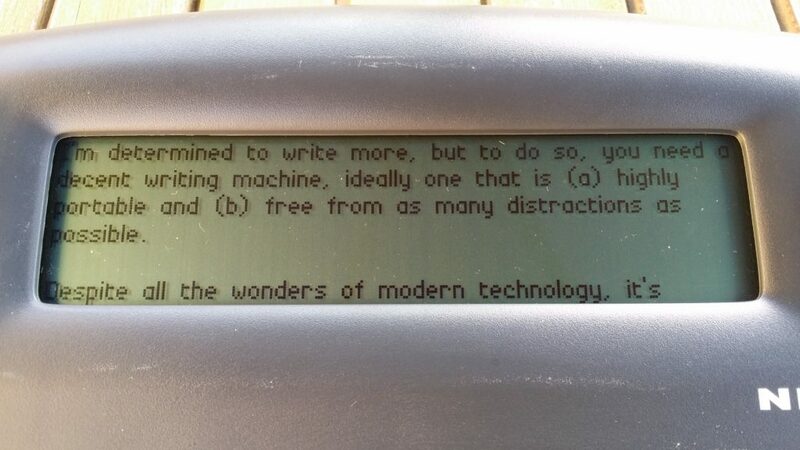 I think it’s quite telling that when I carried a Psion around, I’d knock together pieces of writing all the time, but since I’ve had a smartphone, I’ve dismally failed to do that. So…I’ll pop this in my bag and see how I get on. Hopefully the combination of portable writing machine and lack of Facebook will result in more writing. Time will tell! Watch this space for another toy on the way too, but more about that later. What a neat device! The screen is actually a lot better than I thought from looking at the first photo of it – I was imagining about two lines of text at a time. I hope it plays along with your plan and kick-starts your writing. Thus far it’s been a productivity miracle! I finished reading a book last night, and instead of writing my Goodreads review on my phone, I did it on my Alphasmart instead. It was far longer and more detailed than any review I’ve written before. On top of that, I’ve started writing a short story that’s brewing in my head for ages. The device itself is incredibly simple and has what sounds like a pathetically weedy specification, but it does what it’s meant to do simply and brilliantly. For someone as easily distracted as me, it’s perfect. Ergonomically it’s very good too. I’ve set the screen to the smallest text size as I’m lucky enough to have good eyesight, and it’s perfectly readable – it can be adjusted to several different sizes. It does various other things designed for use in the classroom, which is what it was designed for, but it’s no surprise that writers have jumped on these. I just hope it lasts, because no-one will ever make anything like it again. I’ve not used it out in public yet, but it lives happily in my bag and I suspect it’ll fit just fine on the seat back tray tables on my train to work.